The exact beginnings of humans’ relationship with chocolate are still in question. Archaeologists know that humans tasted chocolate at least 4,000 years ago in Mesoamerica, amidst abundant cacao forests. But the cacao of the ancients was very different from today’s chocolate. For many centuries, chocolate was a bitter drink. Made from cacao nibs, it was akin to modern-day baking chocolate mixed with water. Some cultures drank it cold and some hot. The ancients added flavorings such as allspice, cinnamon, chili powder and vanilla. They may have mixed in maize or sweeteners such as honey, agave syrup or cactus. Then they poured the drink, either from a height or back and forth, to produce a froth—and drank the foam that rose, because it was closest to heaven. The Olmecs, famous for carving colossal stone heads, were the first people known to process and eat cacao beans, which they called kakaw. What’s most interesting is that the Olmecs figured out how to eat cacao at all. Animals simply spat out the hard, bitter seeds, lending no clue to the mysteries inside. The Olmecs had a better idea. They devised the fermenting, drying, roasting and grinding process that remain the basis of today’s chocolate production, which took extensive knowledge of food science and biochemistry. They then passed this knowledge down to the Mayans. Perhaps the first chocoholics, the Mayans were open about their love for cacao. 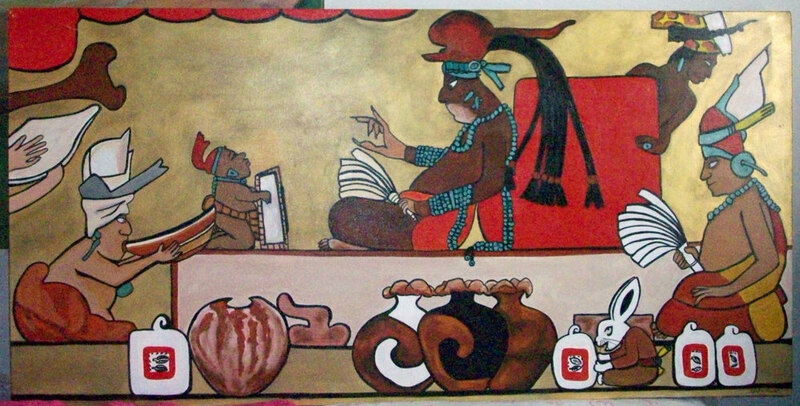 They wrote about cacao as “the food of the gods,” carved the shape of the pods into their stone templates, painted people drinking cacao into their artwork, hired artists to decorate elaborate drinking vessels, placed those vessels in tombs and even used the beans in human sacrifice. They also grew cacao trees, planting them in their household gardens. The Mayans also used cacao for medicinal purposes. Mayan artwork. In the forefront the cacao vases filled with cacao drinks bubbling over, and cacao beans in bags. The early Mesoamericans didn’t keep cacao a secret. Instead, they traded it to their neighbors living many miles to the north. Pottery fragments show that sometime between 1000 and 1125 A.D., people living in northwestern New Mexico’s Chaco Canyon drank cacao from cylindrical jars believed to be used for rituals. At the time a cacao drink coated these jars, the closest cultivated cacao grew in central Mexico. Because cacao is not native to the area, the knowledge of how to prepare and use it would have been imported along with the beans—and having that knowledge may have bestowed prestige to those in charge of the cacao. While the Aztec royals continued the tradition of drinking cacao at ceremonies, they could not grow it in the seat of their empire at Tenochtitlán, in the central highlands of Mexico. As such, they too traded for it, with their southern neighbors the Mayans and others. Aztec rulers also demanded that their tributes, an early form of taxation paid by citizens and those they conquered, be paid in cacao. In the communities themselves, cacao seeds were used as currency, traded at the market and kept locked up. A rabbit cost between four and 10 beans, a mule was worth 50 and a turkey hen went for 100. In fact, cacao was so valuable in early times that it was counterfeited. People would hollow out the pods, fill them with dirt and pass them off as newly harvested. Believing that the god Quetzalcoatl brought the cacao tree to them, Aztecs also used the beans as offerings to the gods. For certain rituals, they added achiote from the annatto tree to turn their cacao red—and signify blood. The Aztecs also are said to have used chocolate to calm those who were about to become human sacrifice!